Nestled high on a hill overlooking the beautiful “ Valley of God ” and surrounded by ancient villages, churches and Etruscan tombs is Casa Melina, a splendid farmhouse, offering its guests tranquility and genuine Tuscan hospitality. Perhaps like no other area in the world, Tuscany has always been a region rich in culture and history. From magnificent frescoes and paintings in nearby churches and museums to the centuries-old, hilltop fortress villages untouched by modern architecture, the area is a virtual living museum waiting for the exploration of visitors. But, Tuscany doesn’t only live in the past. Nearby restaurants and trattorias are testimony to the Italian passion for excellent food and courteous, friendly service. Local festivals offer exciting glimpses into the lifestyle of the residents. Medieval celebrations, food and wine festivals, and art and antique shows are in abundance in the area offering our guests an endless variety of daily activities. Casa Melina offers two delightfully appointed independent guest apartments . Each apartment has been tastefully and artistically de- signed to be comfortable and charming, while offering private bath- rooms and central heating in each apartment. Being light and airy, these apartments each feature kitchenettes for those whom prefer to enjoy a relaxing meal “at home.” Antiques abound and are taste fully interspersed with comfortable furniture to make your stay truly a delightful experience. Additionally, enchanting garden patios offer a wonderful place to enjoy a light breakfast or relax after a busy day and watch the glorious Tuscan sunsets. Your hosts, Stefania Casalini and Bernhard Luettmer, have spent more than two years carefully and lovingly restoring Casa Melina. Great attention has been paid to preserving the integrity of the ancient stone farmhouse while providing modern comfort for their guests. Tuscan bricks have been used on all of the floors and im posing stone walls were rebuilt to keep the flavor of a 17th Cent- ury farmhouse. Gracefully arched windows and striking stone door ways were reconstructed much as they existed long ago. At the same time, all of the bathrooms and kitchenettes meet the most modern standards for the comfort and convenience of their guests. Whether your stay is for a few days or longer, Stefania and Bernhard are always at your service to help with reservations, directions or plan trips into the countryside. 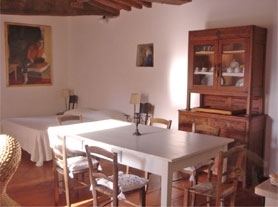 Being true Tuscans, the comfort and satisfaction of their guests is their primary concern. 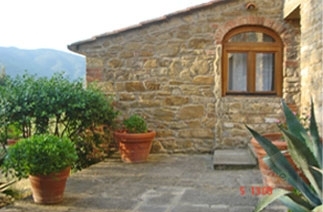 Casa Melina is ideally situated near the medieval hilltop village of Castiglion Fiorentino. Castiglion Fiorentino and its neighboring village of Cortona have excellent restaurants, shopping and night- life, for those not exhausted from the day’s activities. From this central location, day trips to explore the wonders of Florence, Siena, San Gimignano, Arezzo, Assi, Perugia and Cortona are just a short drive away. The celebrated wine estates of Chianti and the famous wine-producing regions of Montepulciano, Pienza and Montalcino are also close by offering the opportunity to sample and purchase world-renowned wines. The major highway A1, express trains and bus service are all with- in moments from the farmhouse offering convenient connections to all of the major cities of Italy, as well as Europe.